This is something truly special. Expertly designed to bring the best in mid-century style to the dining room or kitchen, this distinctive Maysbury solid wood high chair promises to ensure that even the smallest foodie spends mealtimes in snug, safe comfort. Every single element is built and finished by hand to the exacting standard that our Amish woodworkers demand in their own children's furniture, and their drive for quality elevates this piece from simple high chair to family heirloom. The most striking thing about this high chair is the way the design blends beautifully angular Mission style with incredibly intricate woodwork. Every surface is sanded down by hand, giving the chair the kind of glossy, easy-clean smoothness that only hand-sanding can create. Added to this, the smooth tray's clever lip provides protection against escaping peas, spilled juices, and all manner of toddler-sized food events, and the safety harness promises to keep everyone exactly where they should be while they eat. 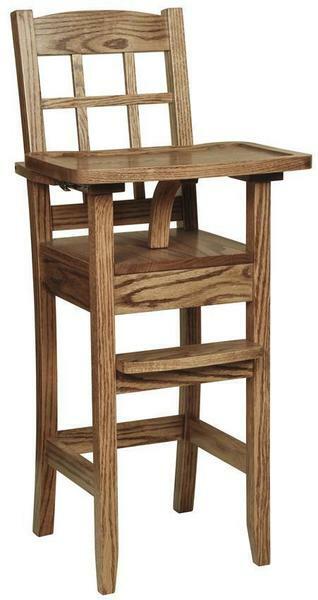 Use the menus above to create your ideal Classic Maysbury high chair. If you run into any questions at all about this piece - small, big, or somewhere in between - please don't hesitate to get in touch with us by phone or by email. Our families and our kids are the most important people to us in the world, and we would love to talk with you about the lifetime of beautiful memories that a solid wood high chair brings to even the most everyday meal.